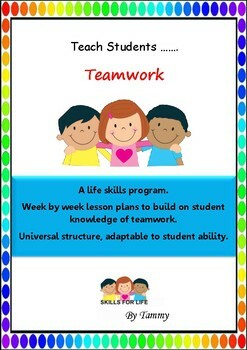 A complete week by week life skills program offering lessons to teach students teamwork skills. An adaptable program of 1 hour, weekly lessons, more than 10 weekly lessons available, so could be used as a term or unit of work. Adaptable to student ability. This unit builds up teamwork skills. 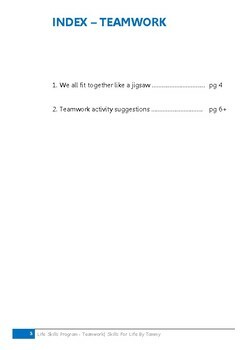 Activities build on the notion that there are many components of team work and why they are important. Lessons include; communication, listening to others, co-operation and trust building. 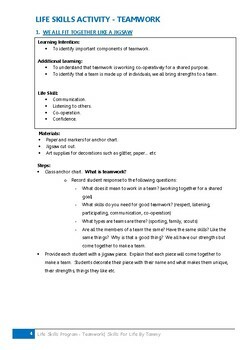 This unit offers an array of teamwork activities. If you like this program, check out others in the same collection, including, independence, communication & emotional intelligence to name a few.